Summary: From the internationally bestselling author of four books, including The Opposite of Me, a vibrant, compulsively readable novel about two married couples who pursue a dream to open a bed-and-breakfast in small-town Vermont. One thing's for sure, I know when I pick up a novel by Sarah Pekkanen that I'm in for a treat. I am pretty sure I've read and reviewed all of her novels, and I always enjoy how she portrays the relationships between her characters. 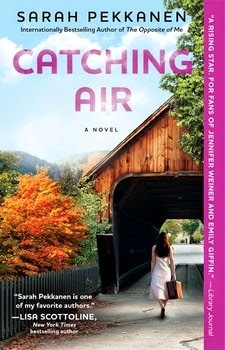 Her latest novel CATCHING AIR will be available next week, and I have to say she's managed to impress me again. CATCHING AIR tells the story of two brothers and their wives who decide to give up their current jobs/lives and open up a bed-and-breakfast in Vermont. Kira and Peter lived in Florida, and Kira was desperate to leave behind her job as a lawyer -- even if it meant moving to a new place and living with her husband's unreliable brother Rand and his wife Alyssa. Alyssa decides to try her luck managing the bed-and-breakfast after she learns that she and Rand can't have children. Her "adventure" becomes exciting when Kira and she book their first major event -- a winter wedding. Things become even more interesting when a woman with a mysterious past moves in with them. I really liked CATCHING AIR and I definitely appreciated Ms. Pekkanen's writing -- no surprise there! Once again, she created a cast of characters that I found very interesting; and she managed to have them interact in a realistic way. While all of the characters had their moments, I especially enjoyed the female characters. The mystery woman's story was intriguing; however, I found myself relating more to Kira and Alyssa. Kira was definitely carrying some baggage from her recent past, and she was looking for the experience at the B&B to heal some wounds. She was extremely organized and conscientious, and she also had integrity -- I could totally "get" so many of her actions. Throughout the course of the novel, she managed to grow and even revisit some of the issues from her past; and I liked how much she evolved. I especially appreciated her relationships with both Alyssa and her husband Peter. Alyssa, on the other hand, was a little more happy-go-lucky and game for trying almost any adventure. Alyssa was struggling with infertility and trying to adopt a child; however, she was also dealing with the immature actions of Rand. I admired Alyssa because she was very different from me, and I liked how her character resolved some of her serious problems. In addition to these three women, the two brothers in the novel had some conflict in their lives. Peter was the more responsible brother and resented Rand for leaving him while their mother was dying. These two had to work through their problems, and it certainly required some work and forgiveness on both of their parts. Ms. Pekkanen truly knows how to explore complicated relationships, and she demonstrated that extremely well with the characters in CATCHING AIR. In addition, she manages to make her characters seem realistic -- often times like people we already know. This novel was very readable because I did become so caught up in the characters, but I also appreciated how she incorporates humor into the tension. This novel definitely had some comic relief! CATCHING AIR would make a very fun book club pick. I'm sure you can already tell that these characters were dealing with some serious issues that would be interesting to discuss. There is a reading guide available with twelve questions as well as some ideas to enhance your book club experience. Some of the themes you might want to discuss include sibling rivalry, responsibility, infertility, marriage, second chances, honesty, and forgiveness. CATCHING AIR is a fun, yet thought-provoking, read! Recommend to fans of women's fiction. Thanks to Engelman and Company for providing a review copy of this novel. I haven't gotten a copy of this yet but I agree--I love Sarah's books. I love Pekkanen's work and hope to get this book soon! I had a "Pekkanen Until You Puke" month awhile back where I read and reviewed all of her books. She is amazing. She was going to send me this one (or maybe it was the last one?) and it never came. I need to do some Pekkanen catch-up. Good summer reading for sure.